Learn how to grow your Orthopedic Surgeons and Orthopedist practices, and increase your practice revenues. Orthopedics stand to grow immensely over the next several years due to the aging population and the need for joint replacement. But in a crowded health care market place, how do you ensure that a growing patient population picks your orthopedic practice? The answer lies in an orthopedic marketing and advertising strategy that builds awareness before a patient even needs your services. This guide will cover the following areas of your marketing and advertising strategy for bringing in new patients. Becoming the most trusted and sought-after doctor for any specialty takes patience, diligence, and planning. So let’s dig deeper in how to do it for orthopedics. To consistently generate new patient leads, you need to have constant awareness drivers in the marketplace. You cannot view marketing as one-off campaigns that you execute every few months with a couple of tactics using just a few marketing channels. Instead, your marketing and advertising strategy should span the full year and have targeted goals and messaging designed for each marketing channel. Online marketing is always on. Your SEO strategy includes monitoring your ranking and finding ways to improve it regularly. To help marketers capitalize on the always-on aspect of online marketing, the concept of inbound marketing was created. Inbound marketing is the idea of creating helpful content that answers the questions your consumers have before ever talking about yourself and what you offer. It’s designed to bring people to your practice through valuable content. Outbound marketing includes marketing tactics that some people now call traditional marketing. In outbound marketing, you push out details about who you are and what you have to offer to your potential customers. An example of outbound marketing is a radio or television ad. The ad is not providing content that a user is seeking, hence, making it something you are placing in front of them and hoping they absorb. Both types of marketing have their place and value when used appropriately. Let’s take a look at how to use various marketing tactics to your advantage. ﻿Conducting an online search before choosing a doctor or any product or service has become commonplace. People are now choosing a medical practitioner just like they decide where to eat on Friday night. With a quick search for what's available near them, they can read reviews, a practice overview and see how close and convenient the office location is for them. But to be on their radar and become a part of their consideration set, you need to take some time to improve your local search capabilities to rank for searches in your area. To do so, you'll need to take a good look at your online presence and how you talk about yourself on various websites. Here's an overview of next steps in your local search strategy. 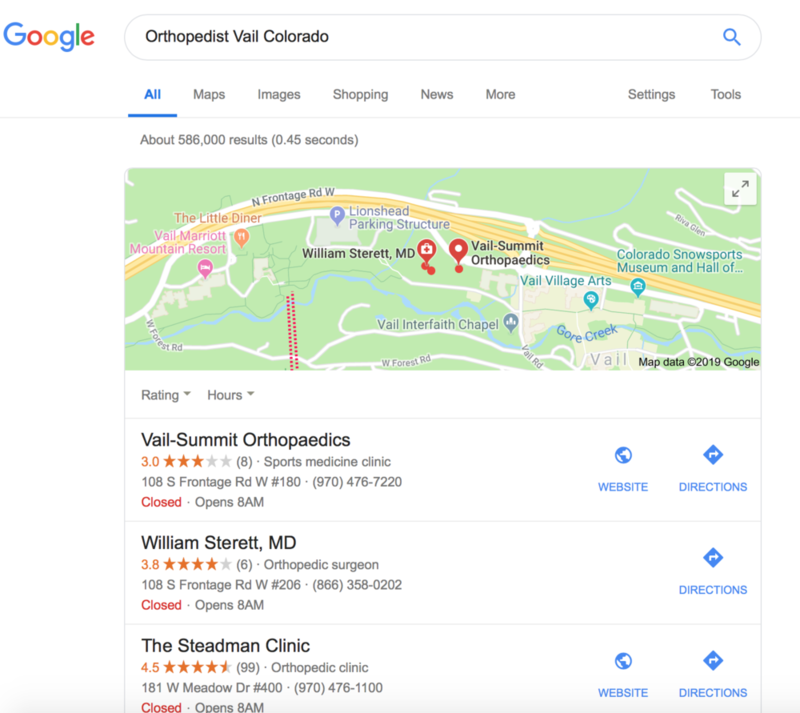 Your cardiology practice might already be listed on Google My Business because Google pulls information it finds on websites to dynamically generate results. If your business is listed, you can claim your business. The process is pretty simple where you claim it and then receive a postcard to verify your information. If your business is not yet listed on Google My Business, you can create your listing with your practice’s contact information. You’ll go through the same process of receiving a postcard in the mail to verify your information. Once you claim your business, you'll receive a monthly report detailing how your listing is doing. You can also monitor and respond to reviews when you receive them, which is essential for reputation management (see the section below for more details). Search engines love consistency. So when you list out your website, be sure that it's consistent across all platforms. You should create a document that details how you'll list your phone number, address and practice name so that you can be sure it's the same everywhere it’s listed on the web. Consistency helps search engines tie your various posts and links together. This way, search engines can be confident that your different listings all tie back to your one business. Reviews help potential patients in their decision to choose your practice. When looking at orthopedists near them, there isn’t much to go on without added details and insights about the practice. When a potential customer sees a review, they can learn from a current patient what the practice is like and reassure them that this is a good practice to choose. When other trusted sites link to you, it tells search engines more about your content and helps them to put more trust in you. The more trusted websites that link to you, the more traffic you can drive to your website and improve your rankings. You don’t want just any links though. Make sure they are from websites that make sense for the health care industry (such as Healthgrades) and that the websites are trusted and good websites to link to. All of the above-listed tactics aren't all that helpful if your website isn't optimized. Once a user gets to your website, is the right content there to make it easy to get in contact with you and prove that you're an excellent choice for their needs? Optimize your website for local search by ensuring your office location is listed in the footer of every page. If you have multiple office locations, it can be helpful to have a page dedicated to each location to earn local awareness for that area. Commit to posting blogs that give you a chance to showcase your expertise and talk about your area so that you can use those keywords naturally on your website. Search engines also like and appreciate websites that are updated regularly, which blog posts can do. Social media gives you a platform to share your content and a bit of your personality. You can use social media to both attract new patients and retain current ones through sharing helpful tips and tricks with your audience. Each social media platform has strengths and ways to use them to their full capacity. To help you build out your strategy, here's a look at the advantages of some of the top social media platforms. Instagram is a visual platform that offers a place to tell stories and connect with people on a personal level. Content that does well on Instagram is videos, images, quotes turned into graphics and show how-tos in graphic form. When you receive a review on Google, you can use a template for a website like Canva, to turn the review into a graphic. This helps you share what’s great about your business with potential customers. Share short tips on how to stay healthy to keep your current patients engaged. These tips can be formatted simply to help your users view the content. Don't just put the content in the caption for the photo because that won't be as eye-catching. One page that’s doing well on Instagram is SPORT Orthopedics & Sport Med (@sportsmedtx). With 8,571 followers, the Instagram page shares tips and information on how to care for your body while competing in sports. They have custom graphics that share helpful information for those facing issues from sports injuries. The profile shares short videos showing the work their doctors do to get athletes back into great shape. ﻿Much like Instagram, Facebook is great for sharing photos and videos. An added benefit of Facebook is that you can post clickable links to share blog posts and information from your website. Facebook also it easy for users to share content on to their followers so that you can increase the reach of your posts. Orthopedics One offers a variety of content on their Facebook page. From information on exercises you should be doing to places where the team is serving as a vendor, the page gives you helpful information in your health and wellness journey. The practice also uses Facebook to share important information, such as when one of their locations changed its operating hours. 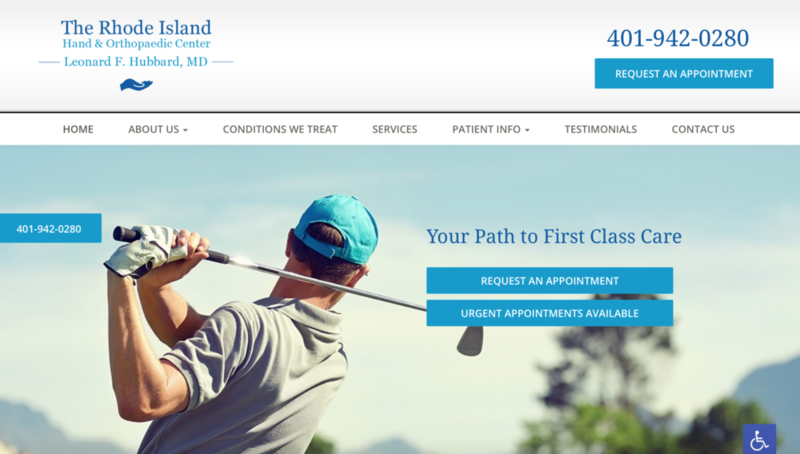 With content ranging from helpful blog posts to informational posts, Orthopedics One offers the mix of content needed to keep followers engaged. Snapchat is a platform where users can share their photos and videos with others either one-on-one or to all friends via their story. This social media tool is quite popular with young people in the 16-30-year-old range. Depending on the focus of your practice, you might benefit from tapping the potential of Snapchat. Unlike other social platforms, the reach for companies on Snapchat is not quite as large with organic traffic. Users would have to know to look you up and follow you to see your content. For businesses, Snapchat can be better used as a platform for ad dollars. You can get exposure on the platform through advertising, which is the best option for businesses to reach people via Snapchat. Additionally, your team can create a custom Snapchat filter that your patients and visitors can use while in the waiting room and near your practice. Place a specific geographic location to show your filter within, and then your visitors can share with their friends what they are up to using your branded filter. This way, you can build awareness for your practice through these users. Pinterest allows you to share content and categorize it under boards. These boards are searchable by other users so that you can get your content out there. If a user likes your content, they can pin it to one of their boards to further share the content. Pinterest allows you to add clickable links to your posts, which is excellent news if you're looking to grow your website visits. Orthopedic Partners uses Pinterest to its full advantage. The team has a variety of boards ranging from a board dedicated to just orthopedics to a board titled "Things We Love." You'll see everything from comic strips to recipes listed on the social media platform. The content Orthopedic Partners pins include their content and content from others. Once you start growing and improving your online presence, you’ll open yourself up to receiving reviews. You can receive reviews on Facebook, Google, Healthgrades and more. Because people can freely speak their mind on these websites without any consequences, you need a reputation management strategy that controls the effects of negative reviews. The fear of negative reviews should not keep you from being on these platforms. A strong reputation management strategy will help you decrease the effects of such reviews. You can have some reviews removed, such as reviews that include profanities, false information or information targeted at hurting your business. But when a review does not fall under one of these categories, you need a plan for how to minimize its effects. Responding to negative reviews can show future prospective patients or visitors that you care, take the time to respond to issues and work to make things right. Therefore, when you respond, be sure to not come off as defensive. Ultimately, your goal is to make the reviewer feel heard in their complaints and make it right where you can. Let’s take a look at an example of good reputation management. Response from the staff: Thank you for your feedback. We’d love to talk to you about your experience so that we can improve our processes and ensure our staff is providing patients with a positive experience. If you would email [email protected], we would appreciate it. The post makes it evident that the team wants to make it right. However, they invite the customer to take the conversation to a more private space. This way the customer doesn’t have to share private health information on Google and the orthopedics’ office can keep the negative comments from continuing online. While digital marketing tends to get everyone's attention currently, there is still a time and space for traditional, print marketing. Print marketing can help you reach patients and prospects differently, outside of your digital marketing channels. Just like your digital initiatives, print pieces serve different functions and have strengths based on the format. Here’s a look at how to use the various types of print marketing pieces. Once a primary way of contacting patients for appointment reminders and updates, postcards now serve as a way to reach patients when you don’t have the means to email or text them. Or, postcards can help out when your messages aren’t getting read or opened. Welcome your customers back when they haven’t seen you in a while. A postcard can be an excellent way of reaching customers who might be overdue for a checkup or who left their treatment plan too soon. Be careful that you don't put private health information on a postcard though because it travels through the mail exposed. You could end up with hefty HIPAA violation fines and a lawsuit if you're not careful. While the risk of HIPAA violations makes postcards seem intimidating, they're a great way to grab your reader's attention because your content isn't hidden behind an envelope. Use this space to your advantage to create stunning graphics that catch the eye of your reader. Mailers are a neat way to showcase your practice via direct mail. Because they can be crafted into any shape or size you'd like, mailers serve as a neat opportunity to earn new patients. If your practice is new to the area, you can highlight your practice and introduce yourself to residents using a mailer. Depending on how fancy you get with your mailer, you can end up spending a large sum of money on it. Be sure to get estimates before moving forward on the design with a graphic artist. Fliers are great because they are inexpensive to design and print. You can easily customize a flier to match the event or occasion that you’re using it at. For example, you could sponsor a local 5K and focus on fitness-related information. Then, be part of a condo open house or assisted living and give more information on healthy aging. Have a designer create a template for you to use where you can easily change out the copy and an image to match your audience. Then use that same flier with adjusted messaging for the various community events you attend or sponsor. Newspapers allow you to target a specific area with an advertisement. Ads within newspapers are generally black and white. Keep that in mind as you work on your ad creative and messaging. Keep the design simple so that it’s easy to see what’s happening when it’s formatted on the black and white newsprint. You’ll have options for how many columns wide you want your ad to span and how tall you want it to be. Keep in mind, that if you choose a smaller ad, you’ll have another ad next to yours competing for the attention of the same audience. Choose the best ad size that fits within your budget and earns you the most exposure. The further back within a section that your ad is placed, the less expensive it might cost, but the fewer readers you’ll likely capture. TV commercials offer an opportunity to reach potential patients in another way. The benefit of video ads is that you can tell a story and showcase the people behind your practice in a way words on a page cannot. To help you build your video ad strategy, here’s a look at some of the best ads orthopedists have used. “Pain is the enemy. Motion is victory.” The ad opens with a bold statement that anyone seeking orthopedic help can relate to. It goes on to discuss the many ways the team at St. Mary has helped people get back to doing what they love. With images of their patients, we get a feel for how orthopedics help a variety of people. The ad works well because its content is relatable for patients and highlights average people, just like the viewers. Kootenai Health Orthopedics' ad tells the story of a woman who rides her bike regularly. The activity is her passion, but health problems kept her away from it. Thanks to the team at Kootenai Health, the woman was able to return to cycling in less time than she'd anticipated. The ad works because of its storytelling. Telling a story within marketing helps take the viewer on a journey before introducing the call to action for them to choose your business for their needs. Russel Medical Orthopedic Services taps the cuteness factor in their ad. It features a little girl explaining what it was like to watch her dad play basketball with a "young guy." In the end, her dad needs a little help to get back on his feet after the experience, and the little girl shares that her dad is now only allowed to play basketball with her 2-year-old sister. The ad grabs your attention with a cute little girl and tells a story. It isn’t your classic health care ad that lists out all the reasons you might visit an orthopedist. Your website is the hub of your online presence. It's your first impression many times for potential customers researching your practice. Because of this, it's crucial that you build out a unique website that informs visitors on why to choose your practice. This website features a vibrant header image that fits in well with the color palette of the practice’s branding. The buttons over the banner make it easy to request an appointment and note that they can fit you in quickly if you need it. Then, you get a description of the practice in detail. While it’s not ideal to have so much text on a homepage from a reader’s standpoint, it is ideal from an SEO standpoint to have the copy in this area. Plus, it allows the team to use their office location for optimizing for local search. Below their office description, the site lists out the most common areas of interest for visitors, including office information, symptoms, and conditions, services, and information on hand therapy. Next, you can explore the team’s testimonials to build confidence in your decision-making process. Dr. Assenmacher’s website is clean and easy to navigate and find what you’re looking for. On the homepage banner, you can click a button to schedule an appointment to see the team, which can be easier than calling for some people. Below the main banner section, four items cover the most common reasons people visit the practice. This way, visitors know that the doctor covers the ailment that they are facing. Next, we get to meet the doctor with a nice photo and bio. This way, when Dr. Assenmacher walks in the room, patients can feel a sense of familiarity with him. In the footer, the team lists their two office locations on every page so that their site is optimized for local search. 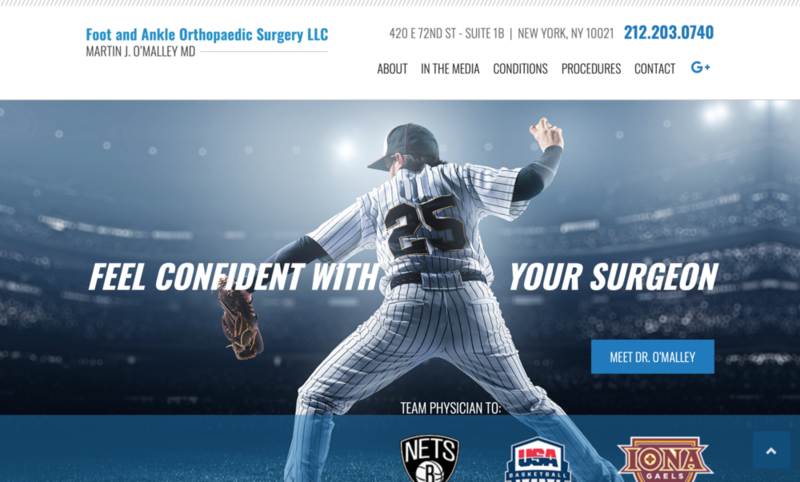 The team at Foot and Ankle Orthopaedic Surgery knows what their market differentiator is and they use it to their advantage on their website. The doctor at the practice serves as the team doctor for three professional sports teams, making it clear that this is a quality doctor. You can get to know Dr. O’Malley when you scroll just below the main banner image. Then, get to know the various types of injuries the team treats and where their specialties are. You’ll also learn the unique treatments the office offers. The “In the News” section highlights the practice’s work with high-caliber clients, such as sports professionals. On the homepage, there’s a map with the office’s contact information so you can easily get in contact. Once a customer gets to know you online, they'll expect the same experience in your office. This means having robust technology in your practice to provide outstanding patient care and a good in-office experience. Here are the top software programs for your practice. DrChrono EHR is a leading technology for doctors of all types, including orthopedists. Put the right information at your fingertips with integrated intake, charting and billing. Use the web-based software to complete your e-prescribing and scheduling. Custom forms enable your team to create workflows and templates to make your office visits move seamlessly so you can spend less time documenting and more time interacting with patients. Your patients will love DrChrono EHR too because it has a patient portal where they can view test results and review information on their upcoming appointments. AdvancedMD is a software suite with tools including finances, telemedicine, business intelligent reports and everything you would expect out of an electronic health record system. The security of the cloud system enables you to access the information from anywhere, anytime. The software works through your web browser or as an application on your Windows or Mac computer. NextGen offers an EHR with integrated functions, such as merit-based incentive payments, which is required under health care reform. The software is excellent for practices of all sizes and will grow with your practice as you welcome new patients and expand. As a cloud-based platform, NextGen offers all the functionality you need in one platform. Going from charting, to e-prescribing and viewing a patient’s lab results.